Caldecote v Stevington. Picture: David Kay. Sam Julian, Tom Wallace and a Jake Wallace penalty marked the home scoresheet against replies via Sheldon Washington and Martin Danobrega. Whilst jumping up into second, just goal difference behind Caldecote, are Ickwell & Old Warden who ran out the 8-0 home winners over Kempston Rovers Development. Ashley Drummond led the way with a hat-trick, with Dan and Lee Threadgold grabbing braces to go alongside a single goal from Scott Alleyne to completed the rout. Former Premier Division supported by Sportsform leaders Shefford Town & Campton dropped down as they sat the afternoon out. 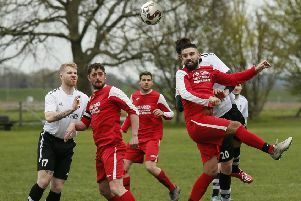 Perhaps the shock result of the day belonged to Cranfield United who won 2-1 at Crawley Green Reserves to dent the home side’s Championship challenge. Ali Smith and Antonio Ricciardi netted the United goals against a lone reply via Temitayo Akerele. It was a good day on the road for AFC Oakley M&DH who won 5-2 at Queens Park Crescents, Elijah Hukin with a hat-trick joined on the M&DH scoresheet by Alex Liburd and Jack Hadden to bring up the nap hand against Crescent replies via Shahiaur Rahman and Dominic Parrella. Wilstead were the 2-1 home winners over Flitwick Town, Paul Jones and Ryan Davenport netting the home goals and Daniel Stafford replying for the Town. With Riseley Sports away on Centenary Cup duty Totternhoe Reserves climbed back onto the top of the Division One supported by O’Neills league and retained their 100% home record with a 7-0 victory over Flitwick Town Reserves. Johnny Clarke led the way with a hat-trick and joined on their scoresheet by Tom Mills, Lee Fromant, Charlie Tickle and Dave Brien all of whom netted single goals. For third place Wixams it was a 6-4 away win at Biggleswade FC Reserves. Gareth White and Danny Butler both netted twice to go alongside single strikes from Grant Tibbett and Alex Summers against home replies via Ewan Smailes, Ethan Nurettin, John Veal and Gianni Battezzzati. Lea Sports PSG took their winning home ways up to four games in beating Henlow 1-0 thanks to a strike from Bradley Jenkins. Elsewhere Cople & Bedford SA drew 1-1 at home against Sandy, the SA goal being an own goal and Sandy’s coming via the penalty spot from Peter Rogan. AFC Kempston Town & Bedford College Reserves will now journey to Totternhoe Reserves for a last four tie next weekend after winning 13-0 at Meltis Albion. Charlie Corcoran scored five times and Keegan Roberts a hat-trick and they were joined on their scoresheet by Chris Allan, Chris Wright, Martin Ivy and Michael Sexton who all netted once. Cranfield United Reserves will contest this seasons Centenary Cup Final after they netted a 4-3 home penalty shoot-out win over Riseley Sports after the sides were deadlocked 1-1 after 90 minutes play. Paul Ayles made the United scoresheet and Duncan Campbell replied for the Sportsman. For leaders Henlow Reserves it was the requirement of a time added on equaliser to salvage a point from a 2-2 draw at home to Elstow Abbey to go four points clear from Bedford Albion who, having played two games less, now take over the mantle of championship favorites. Russell Ayles and Chris Powell were on the home scoresheet and Danny Pilgrim and Travis Joseph netting for the Abbey. Also having a dent put in their championship hopes were third place Wilstead who lost 2-1 at CS Rovers, Connor Darocha netting both Rovers goals and Sam Ward replying for Wilstead. Fourth place Marston Shelton Rovers Reserves were held to a 3-3 draw at Atletico Europa. Paddy Alimanji, Aaron Van Horn and Mohammed Awals on the home scoresheet against Rovers replies via Dale Malciw, Carl Borremeo and Garry Russon. Luton Leagrave AFC extended their unbeaten sequence to five games with a 4-3 victory at Houghton Athletic who were suffering defeat number five on the bounce. Lewis Bloomfield and Hartley Coleman both netted twice for the visitors against Athletic replies via Aaron Blake twice and Max O’Brien once. Caldecote Reserves eight game unbeaten run was halted when they were beaten 3-2 at AFC Oakley M&DH Reserves. Brad Duffet, Ray Patrickson and Jamie Endersby on the home scoresheet against replies via Nick Thomas and Liam Beech. Bedford Albion will now face a home semi-final tie against Henlow Reserves next weekend after a lone goal from Ben Worbey took them to a 1-0 home win over Westoning. With Kempston Athletic away on Watson Shield duty their lead in Division Three is now down to just a single point after Harlington extended their unbeaten run to 14 games by winning 6-2 at AFC Kempston Town & Bedford College A. Farrell Whitman led the way with a hat-trick with Pearce Tracey grabbing a brace and Chris Kelly netting once against Town replies via Harvey Eagle and Martin Smith. Also enjoying life on the road were Lidlington United Sports the 4-2 victors at Stevington Reserves. Edward James, Mark Reynolds, Carl Pearson and Max Penn netting the goals to do the damage against home replies via Alex Smith and Liam Donavon. However the biggest winners of the day were Bedford Albion Reserves who netted a 6-0 home win over Dinamo Flitwick. Michael France with a hat-trick joined on their scoresheet by single strikes from Adam Wodecki, Craig Hanna and Aaron Fletcher. After four straight defeats White Eagles lifted themselves off of the bottom of the league standings at the expense of Dinamo Flitwick with a 4-0 home win over Wootton Village. Rafal Cygan, Hinch Ion, Bartesz Sekretarski plus an own goal doing the damage. Sandy Reserves won for the fifth time at home on the bounce by beating Flitwick Town A 2-1, Mark Jennings and Aiden London their goalscorers against a Town reply via Scott Gadsden. Caldecote A took their unbeaten ways up to nine games in sharing the spoils from a 0-0 draw at Shefford Town & Campton A.
Kempston Athletic will now contest this season’s Watson Shield Final after emerging the 6-5 penalty shoot-out winners at Black Swan after 90 minutes play had saw the sides deadlocked at 1-1, Ben Smith netting for the Swan’s and the Athletic reply being an own goal. Their opposition remain unknown after the second semi-final between Bedford Saturday Youth League side Barton Rovers and Clifton was abandoned just before the hour mark due to a serious injury to Clifton player Josh Darnell. The Rovers led 1-0 at the time.